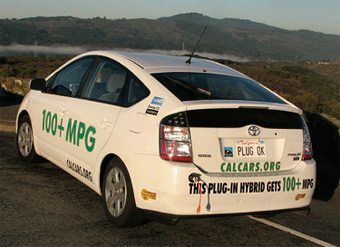 California Cars Initiative (CalCars.org) founder Felix Kramer converted this Toyota Prius to a plug-in hybrid in 2006, and has taken it around the country to promote the potential of PHEVs. Another source of urgency for the smart grid is meeting goals for getting more “clean” cars and vehicles on the road. Electric vehicles largely eliminate greenhouse gas emissions from vehicle tail pipes. As part of the stimulus package, President Obama set a goal of putting one million or more plug-in electric hybrid vehicles on the roads of America by the year 2015. Several manufacturers have electric vehicle programs in the works. Congress included a taxpayer credit of up to $7,500 for purchase of plug-in electric vehicles. Passenger cars aren’t the only hybrid vehicles. Most cities operate hybrid buses that combine electric battery operation with back-up power from diesel, gasoline or another source. Smart grid technologies are an essential step toward a large-scale conversion to electric-powered hybrid vehicles. Pure electric vehicles rose from 11,380 in use in 2000 to over 55,730 in use in 2007. Sales of non-gasoline vehicles are expected to increase from 11 percent in 2007 to 41 percent of all vehicle sales by 2022, according to the energy information Administration’s Annual energy outlook 2008. While standard hybrid electric vehicles contain both a battery pack and electric motor, PHEVs can recharge their batteries with electricity from a standard outlet. A major challenge to large-scale usage of electric vehicles will be matching the ease of distribution of today’s street corner and freeway off-ramp gas stations. Electric cars will require a reliable, ubiquitous recharging network allowing consumers to recharge conveniently including at their work place. With a smart grid, part of the recharging demand can be met at home, in the garage. 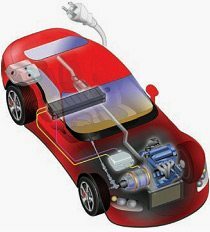 But a recharging system for cars on a larger scale is necessary for a significant replacement of petroleum-powered vehicles. Smart grid technology can provide the basis for more consumers to adopt plug-in hybrids or pure electric vehicles. It’s not all about what the smart grid can do for the electric car. Pooled together, electric cars can do a lot for power management, too. 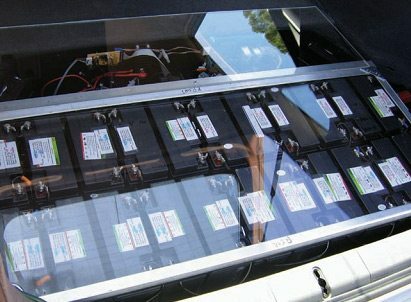 The concept of vehicle-to-grid, or V2g, envisions electric cars with batteries can also act as storage. They may take power from the grid when wind power surges, for example, then store it to feed back. An energy executive involved with the Boulder, Colorado, grid projected that one day a network of electric vehicles, “can be a small power plant for us. A smart grid could also enable electric vehicles to serve as a source of ancillary power for the grid. For example, smart grid technology enables household solar collection to be stored in batteries and used to recharge a plug-in hybrid electric vehicle. Once these vehicles reach the market, gasoline price spikes and eco-friendly marketing will fuel their popularity – made much easier by an integrated, at-home charging method flowing from smart grid. The original battery pack in the CalCars Prius used short-life but resilient lead-acid to develop design criteria for higher-performance batteries. Two scientists who evaluated vehicle-to-grid capacity and revenue posited that V2g could evolve into an effective supplier of quick-response, high-value electric services to balance load fluctuations. “The societal advantages of developing V2g include an additional revenue stream for cleaner vehicles, increased stability and reliability of the electric grid, lower electric system costs and eventually, inexpensive storage and back-up for renewable electricity,” they concluded. The grid may one day help power the increasing numbers of hybrid-electric buses, shuttles and trucks, too. Several manufacturers have offered hybrid buses for over a decade and new York City already operates over 300 hybrid buses. Resource: Moving forward on smart grid By Rebecca L. Grant, Ph.D.